The piano was first demonstrated in London by Charles Dibden, who is most famous for his sea songs. Between the acts of a performance of The Beggar's Opera at Covent Garden, on 16th May 1767, Dibden accompanied Miss Bricklet on the `new pianoforte'. So besides all his other skills as singer, composer, novelist and above all composer, he played the piano. The youngest of eighteen children, he was trained as a singer and later created many entertainments, performing especially at Drury Lane. He wrote and composed upwards of 1400 popular songs mostly to do with the sea. 'I sailed from the Downs in The Nancy', 'Saturday Night at Sea', 'T'was in the Good Ship Rover', and dozens of other patriotic songs, including the immortal Tom Bowling, written on the death of his eldest brother Captain Thomas Dibden. Charles Dibden lived in Arlington Road, Camden Town and is buried in the churchyard between Bayham Street and Camden Street. It is a strange coincidence that the piano industry should later have grown up in his own back yard. Piano manufacture, which had started in the West End, moved first to Tottenham Court Road and when Collard & Collard and other famous firms like Brimsmead, and Challen, moved to Camden Town. This encouraged other firms to set up nearby. Camden Town was a very suitable centre for piano manufacture. The Regent's Canal could be used for transporting heavy and bulky goods like pianos cheaply, either to the west and so to the complete canal system which covered the Midlands, or east to the docks and from there all over the world. Camden Town was also near the rail-heads of King's Cross, Euston and St Pancras, so transport conditions by water and rail were ideal. Soon the area became a centre of the piano industry. The fortunes of one man may be taken as typical of many. John Sandon, my grandfather, was born in 1851 and at the age of thirty-one he went into partnership as a piano manufacturer with a man called Steadman. Neither appears in the Post Office Directory before this, so presumably it was a first-time venture for both of them. They took premises at 54 Queen Street, Camden Town. By the time Sandon & Steadman set up their business, London had over two hundred piano making firms, three quarters of them north of the river. Manufacture in North London developed early and by the time the southern suburbs were built, the piano industry was well established along the Regent's Canal, in Stoke Newington, Islington and especially in Camden Town. Some were large firms, making complete instruments on a mass production system, moving them from department to department as the work progressed, as Collard & Collard did in their famous circular factory in Oval Road. Twenty-two windows with a bench under each to give good light and a central lift to move the instruments from floor to floor. The circular shape gave the maximum floor space for the minimum bricks and the maximum light. It is strange the Camden Town has two fine circular buildings, this and the Roundhouse. 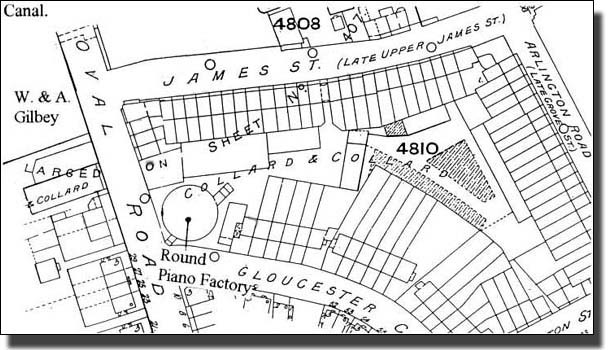 The Goad Fire Insurance map shows that Collard & Collard had a concentration of factories at the end of Oval Road. Each part of the process had its own space. Casemaking, tall-making, the `ware room', and `bellying' (whatever they were) `finishing' and others. Behind the Oval Factory, in the triangle bounded by the houses in Gloucester Crescent, Arlington Road and Jamestown Road (now occupied by the flats built by Community Housing) was a range of other buildings, each with its specialist use. Veneer store, timber stores, engineers' shops, french polishing, fret-cutting and wood turning, glue boiling, stringing shops, key loading, where the keys were balanced with lead weights to make them return rapidly, and further rooms where a dozen other specialist skills were performed. Other firms were little more than small assembly shops in back kitchens, with parts bought in ready made. One old piano maker said, "Sometimes, on a Friday afternoon, you could meet the boss of one of these small factories hawking a piano round the district in the hope of selling it for cash, twenty pounds or so, to pay the wages and the rent". Piano firms were in all sizes - whales and minnows." Besides manufacturers there were small-part makers, clustering round the big firms. 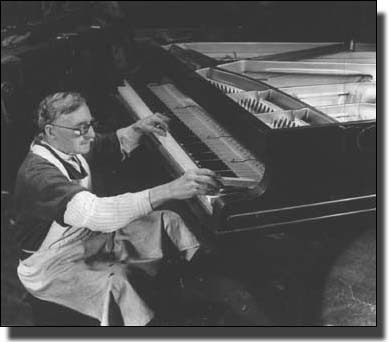 Piano key makers; wrench pin makers; sellers of key leads; hammer coverers; incisors, who cut the fretted wooden fronts; truss carvers; gilders; marquetry workers; french polishers, veneer, timber and ivory suppliers; makers of piano castors; candle-sconce makers; piano stool, music cabinet makers, piano-back makers; piano movers, storers, tuners and salesmen. All these found a living in and around Camden Town and along the Canal. It was in this atmosphere that Sandon & Steadman had set up business in 1883. In 1884 they took extra premises at 14 Charlton Street, Somers Town, between Euston Station and St Pancras. Perhaps the lease was running out, because they left Queen Street in 1885 and took further premises in Drummond Street, Somers Town. The firm must have prospered for, by 1890, they had taken a showroom in Berners Street, off Oxford Street. Clearly it was a flourishing business at this time. John Sandon had a growing family, Britain had come out of the 1887 slump and the future must have looked propitious. The firm continued in these three premises until 1889. John Sandon's son, John Edward Sandon, the oldest of the children, had joined the firm as a salesman. He showed off the pianos to customers at Berners Street but, when he was only twenty-one his father died. They retrenched immediately. By 1900 they had abandoned both Berners Street and Drummond Street, but it was not enough. The firm lasted only another eight years. The name does not appear in the Post Office Directory after 1908: nor does Steadman's name appear alone, so it was the end. German competition had driven them out of business, but no doubt the untimely death of one of the founders before his son was capable of taking over, may have hastened the result. In 1911 there were still 136 piano firms in Britain, all but three manufacturing in London. With all these surviving in Islington, Camden Town and Stoke Newington, there seems no reason why Sandon & Steadman too could not have weathered the economic conditions for a while, but the firm would not have survived for ever. After 1900 the British piano industry became cut-throat, insecure. Everything was short-term and without vision, so that the standard of workmanship fell. Training schemes were introduced by some firms to attract young workers, but the market continued to shrink and young people refused to enter an industry which offered so few prospects. By 1912, German exports of pianos and piano parts were sixty-five times as large as Great Britain's. Germany dominated the piano industry rather as Japan was to dominate the electronics industry after the Second World War. There was a small revival in the piano industry immediately after the First World War, though this was soon affected by the rise of the gramophone, cinema and radio. Collard & Collard left in the 1920s and their round factory was occupied by garment firms, engineers and printers over the years. Output recovered somewhat in the 1930s, reaching 60,000 pianos in 1936. During the Second World War there was a reprieve for one small Kentish Town firm. Every ship in the fleet had to have a small organ which could be used for entertainment and for playing hymns on a Sunday morning, but this boost was short lived. After the War, piano and organ making were still declining, threatened this time not by Germany, but by Korea. In the 1960s, the Koreans had begun to make pianos. Their first ones hardly worked, yet in a very few years they were producing splendid instruments. They approached piano manufacture not as a craft industry, but as a modern engineering problem, using the latest machines and production methods. Traditionally piano parts were made by small-batch production and the parts then fitted together. Indeed a fitter is a man who takes other people's parts and makes them fit. The Koreans insisted on modern machining accuracy. They were machining parts to 3 microns, so that every part fitted first time. The skill and time of the fitter were no longer required, so that pianos could be assembled, not fitted. The drop in production costs was enormous. Soon the Royal Academy of Music began buying Korean pianos. In 1993 the local telephone book listed a few piano shops in North London, piano removers and tuners, but no piano manufacturers at all. Heckscher & Co, in Bayham Street, is almost the sole survivor of the piano industry in Camden Town. This firm began in Germany in 1869 and moved to England in 1883, where they set up as manufacturers in the West End. Today they are suppliers of piano parts, not manufacturers of pianos. Repairers write for the hundreds of different parts which go to make a piano - replacement wires of all gauges, lengths of green baize an inch wide, new keys, or any of the other parts needed to keep a piano in order. A very necessary service, but not the same as manufacture. About 1970, when industry in Camden Town was almost defunct, I cleared out part of an old piano factory. There were off-cuts of American Black Walnut and mature Japanese Oak which had been seasoning for over thirty years and cut like butter - all the unremarked debris from an old factory. The owner was retiring because of rising rents and falling business. 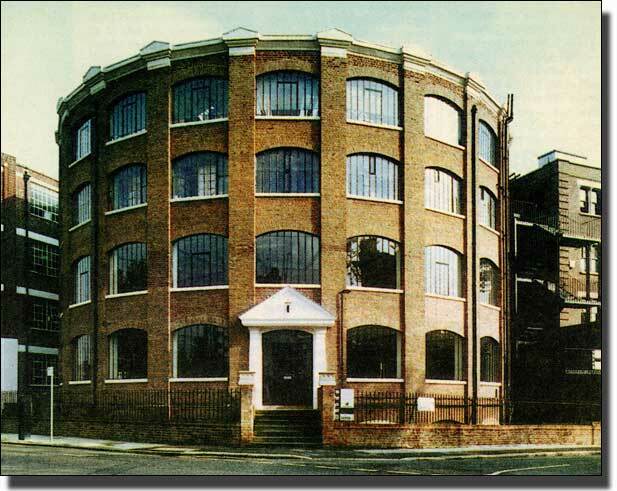 His mews factory was being refurbished and restored as part of an urban renewal programme. This included a new roof of Welsh slates at £3 each. At a time when huge new factories and trading estates were being erected on green-field sites, with roofs in corrugated iron, this inner-city factory was being treated like a stately home and priced out of any future manufacture. The owner, a man of long experience, knew it was time to get out. The planners were working to the ideas current at the time. Industry should be zoned away from housing, preferably in a New Town beyond the Green Belt. Old buildings in London had to be restored to their original condition, in materials used at the time they were built. The fact that those materials had become extremely expensive was irrelevant. Authentic restoration came first. No industry could have supported this cost. With the best will in the world and hoping to improve people's lives, planners were destroying industry. The same thing was happening all over London and industrialists were living in different worlds, but nobody had thought through the consequences. Within a few years the delicate network of local employment was shattered. London, which in Victorian times had been the biggest industrial city in the British Isles, had lost its industry. Instrument making in Islington and Clerkenwell, gunsmiths in Paddington, furniture in Hoxton, metal casting in Bayham Street, brewing in Hawley Street - industry withered or fled. The site of Collard and Collard's piano factory in Oval Road has a history typical of the area. Once a state of the art factory, the firm closed down when public demand for pianos fell and new production methods were introduced. The part of the site to the west of Oval Road was redeveloped by Gilbey's, who themselves later left for Harlow. On the east side, the Round Factory had stood, not derelict but dejected and unloved, for years. It housed printers and other firms for several years. By 1994, now listed grade 1, it had been restored, renamed The Rotunda, and housed design consultants Jones, Knowles, Ritchie and the Virago Press. The rest of the Collard & Collard site has become new low-rent housing. This typified the change which was happening all over Camden Town. It was becoming a centre for TV companies, publishers, designers, and the media in general, or being redeveloped for housing, as we shall see.